Often the recommended treatment for one of the most common types of lung cancer, the slower growing type known as non-small cell lung cancer (NSCLC), is the removal of a lobe of the lung (a lobectomy). Although the lungs have multiple lobes, three for the right lung and two for the left, removal of a lobe is a major operation with obviously considerable trauma. Brachytherapy is also sometimes called sealed source radiotherapy. Brachy comes from a prefix that means short-distance. This form of radiotherapy can be used alone or in combination with surgery. Our application combines surgical wedge resection of the lung with application of radioactive seeds in a specific pattern designed by collaboration with our radiation oncologists. The operations are performed with a team approach so that both the lung resection and the application of radiotherapy are optimized for both the disease and estimated residual lung function. Not all patients with NSCLC are physically capable of safely undergoing the procedure. For example, patients who are suffering from various types of heart disease or whose breathing is already compromised by a lung problem such as chronic obstructive pulmonary disease (COPD) may not be able to tolerate a full lobectomy. One of the solutions for such patients is to combine limited lung surgery, where small portions of lung tissue are removed, plus radiation therapy of a type that is applied during the same surgical operation. In long-form medical terminology this is called sublobar resection and brachytherapy. A sublobar resection is surgery that removes tumors or specifically identified cancerous tissue from a lung, as contrasted with removing an entire lobe. For the most part this method is recommended for cases where patients definitely cannot withstand a full lobectomy. 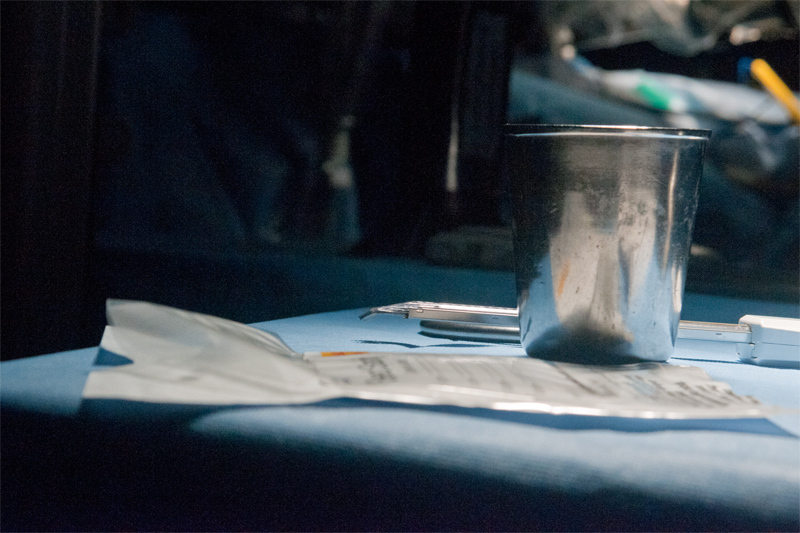 The lobectomy is still considered the most effective general approach, but over the last decade advances in techniques have enhanced the success rate for both sublobar resection and radiation treatment. A key factor for the success of sublobar resection is the removal of small early stage tumors. Early detection is important for success in all types of lung cancer treatment, but is particularly important for people with other serious health problems who have also developed non-small cell lung cancer. The key to a potential surgery-radiation combination is diagnosing and locating lung cancer at the earliest clinical stage, identified as 1A. This is the most treatable stage when tumors are small and is well before the spread of cancer by metastasis. A major contribution to sublobar resection technique was the advent of computer tomography (CT), which makes possible accurate and detailed imagery of lung cancer for diagnosis and treatment. By scanning a sequence of cross-sectional images, computer tomography can precisely locate the smaller tumors (2 centimeters or less) associated with early stage NSCLC. This is especially true for what are called tumors with indolent behavior, meaning tumors that cause no pain, such as bronchoalveolar carcinomas (small tumors in the lining of the lungs). The clear imagery also provides an effective guide for where to perform the surgery and how much tissue should be removed. Removal of an entire lobe of a lung usually results in significant loss of lung capacity. This may be a critical factor in recovery and the long-term activity of patients with other lung or heart issues. The general approach of sublobar resection typically has less impact on the lung capacity. Sometimes the relatively small loss of lung capacity may make follow-on surgery possible, if it becomes necessary. One of the most important additions to the effectiveness of sublobar resection is the supporting (adjuvant) use of radiation therapy, applied at the same time as the surgery. Finally, the development of robotic surgical equipment and techniques has improved surgeons’ ability to perform delicate, small scale work in the close quarters of the human chest. The main objection to sublobar resection is the risk of leaving behind cancerous tissue, which then can regenerate into tumors. However, the combined effects of new techniques, such as the ones listed above, have produced results in clinical trials that are on a par with conventional lobectomy. In fact, sublobar resection is now a potential option for some people who do not have other debilitating diseases. Removal of tumors or sections of a lung is usually a necessary step to reducing the overall amount of cancer, but it is sometimes not sufficient to remove all cancerous tissue or limit the possibility of recurrence. This led to the development of a technique known as brachytherapy, which incorporates radiation treatment administered at the same time as the surgical procedure. One of the key goals of most radiation therapy is to limit the effect of the radiation to the area most affected, specifically tumors in the case of many cancers. Following this line of thought, the idea of inserting radioactive material directly into a tumor goes back to 1901 and one of the pioneers of radiation research, Pierre Curie. There have been many innovations in the type of radioactive material used and especially in the delivery format. Most modern brachytherapy uses what are called radioactive “seeds” that are incorporated into the sutures used to close the area where a tumor was taken out, or incorporated into a mesh left in the cavity where tissue was removed. The seeds range in size from a grain of rice to a short tube shape like a piece of lead from a pencil. For the lungs these seeds usually contain very small amounts of radioactive Iodine 125. The radioactivity scrambles the reproduction of cells, so that the cells die or grow very slowly. Both cancerous and normal cells are affected, but normal cells have a greater ability to repair the damage caused by the radiation. Robotic brachytherapy with wedge resection for peripheral NSCLC is an area where we believe that the precise application of robotics and our team approach allow for optimal outcomes. If you are in a situation where you are not an optimal candidate for formal lobectomy then it is likely because your lung tissue itself is already damaged. The precise application of the seeds using the robotic dexterity may both facilitate seed placement and limit operative lung trauma. There are several important advantages to this approach: The seeds are encapsulated by a material of the suture or mesh called polyglactin (Vicryl) that is eventually absorbed by the body. This and your body’s healing process make it possible to maintain a relatively steady dose of radiation over a specific period of time, often for weeks or months. Because the seeds are placed directly at the area where the cancer occurred, their effect is highly targeted and requires lower radioactive dosage. The targeted low dosage usually results in greater effectiveness in destroying cancer cells and less damage to nearby healthy cells. As a rule, sublobar resection and brachytherapy treatment is followed by further observation with CT scans of the affected area. Studies indicate that the combination of techniques produces significantly better results than either technique alone. The field of brachytherapy, already considered a specific form of treatment, is one of the faster developing areas in the treatment of cancer. We expect that during the coming decade the combination of customized seed materials, more precise information about dosing, and the development of robotic techniques for seed placement will continue to increase the effectiveness of brachytherapy. The combination of surgery to remove small lung tumors and brachytherapy to prevent cancer recurrence was tailored for people whose ability to withstand major surgery is limited. It follows that the application of minimally invasive surgery through the use of robotic equipment takes that approach another step. Briefly described, we use the da Vinci Surgery System, developed by Intuitive Surgical, Inc. The da Vinci system has four robotic arms, each equipped with miniaturized surgical instruments that are controlled by a surgeon sitting at a computerized console. The surgeon views the surgical area with a computer enhanced image from an internal video camera (endoscopic video). To access the area(s) of the lung where the cancer is located, only the tiny surgical instruments are inserted into the body, typically through four or five small incisions, each not much bigger than a dime. This is why the robotic surgery is considered minimally invasive. Operating on the surface of the lung with the robotic system, the surgeon views the work area through a specialized endoscopic camera that provides its own lighting, produces high resolution images, and is fed through a digital image processor that helps to add enlargement, contrast and clarity to the view. The robotic arms and instruments are able to translate very subtle hand movements, such as ‘wristing’ (small twists of the wrist) and accurately scale the force of movement to produce very delicate maneuvers – and without tremors. The control and precision of the robotics are particularly effective for the sensitive lung tissue involved in a sublobar resection and for the placement of the brachytherapy seeds. 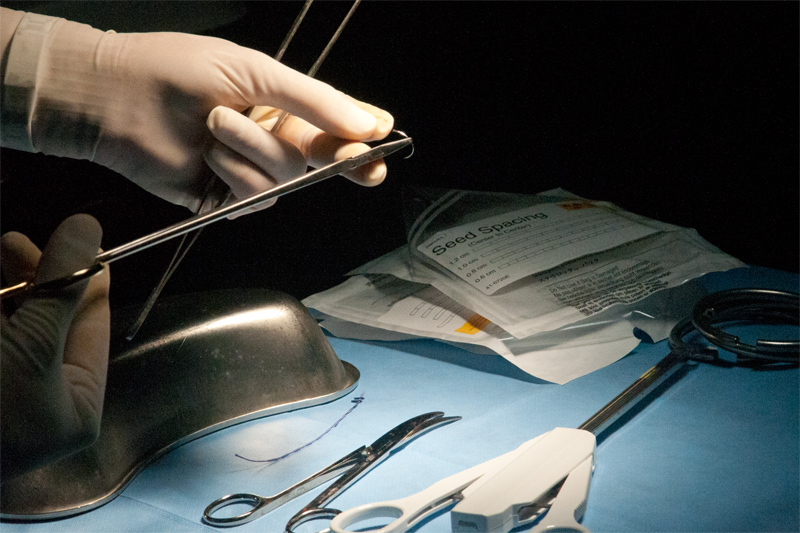 The combination of very small instruments, very fine motor control and an enhanced image makes it possible for the surgeon to perform the combination surgery and brachytherapy with the least possible damage to tissue. In general, the robotic surgery results in less physical trauma, which translates into less risk of infection plus faster healing and recovery times. While this may not seem like an optimistic point, the less trauma and the more precise the radiation delivery, the better are the prospects for further surgery if needed. Minimally invasive treatment with a combination of surgery and radiation may be optimal but for people with compromised health.